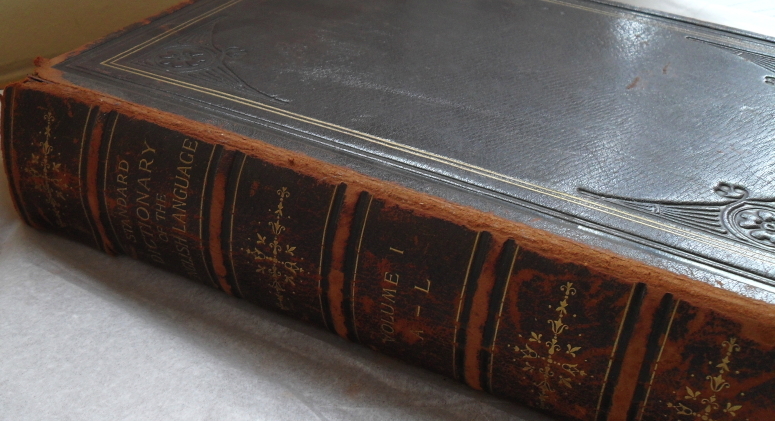 In the early 1890s, Muybridge contributed to the first edition of Funk & Wagnalls’ Standard Dictionary of the English Language, one of the great American dictionaries. 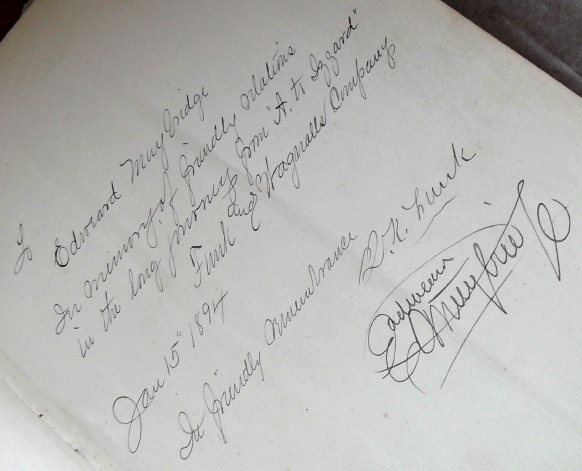 His presentation copy of the two-volume work, with a handwritten dedication by Isaac Kaufmann Funk, was kept by the Lawrence-Smith household at Park View, Kingston, where Muybridge was living until his death in 1904. The family’s maid Nellie Sawyer was just 14 years old when she started employment in the household c.1902 and continued as cook, housekeeper and nurse until lastly Miss Katy died and Nellie retained the Dictionary. Her great nephews David and Roger Prince regularly visited their elderly aunt, and there was often talk of Mr Lawrence, Miss Katy (Catherine Plow Smith), Mr Muybridge, and Park View. 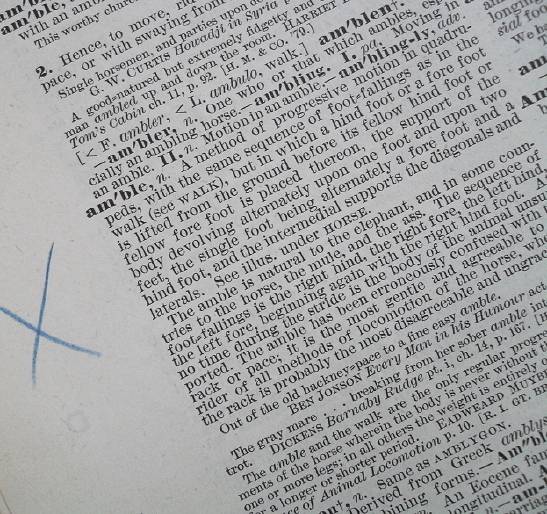 The Dictionary passed to their mother in 1966-67, and the family generously donated the set to Kingston Museum in 1998. Muybridge had been given the task of writing entries relating to Animal Locomotion; yet another indication that Muybridge’s own scientific analysis of his photographic sequences has been used for texts in authoritative reference works. (So, doubters – ‘Go look that up in your Funk & Wagnalls’, as they used to say on Laugh-In.) Entries included line drawings based on the photo sequences. 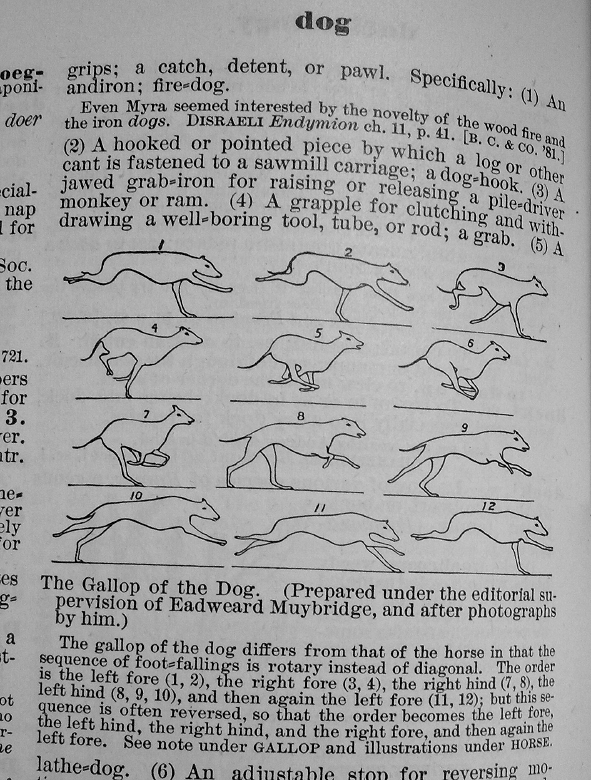 A reference work, Farm Live Stock of Great Britain by Robert Wallace (probably the 1893 edition), used six examples of the drawings from Funk & Wagnalls, from “advance sheets of the Standard Dictionary”, which was then still in preparation. Muybridge also “revised and corrected the letterpress”. Thank you Nellie May Sawyer, for keeping the Dictionary safe for so many years, and thank you to David Prince for kindly supplying information provided in this post, and to Peta Cook and Jill Lamb of Kingston Museum and Heritage Service. Proving that just one of Muybridge’s thousands of images can support an entire essay, Luke McKernan philosophises about ‘The running man…’ – at The Bioscope. Here’s a small sample, but do read the whole piece. “It is perhaps the most iconic of all photographic images. Eadweard Muybridge’s running man (he made several photographic sequences of a man running, but I’m thinking of the one illustrated here) conjures up the very idea of photography. It has captured the instant, has brought a moment out of its specific time into all time. We can hear the click of the shutter. It is one of a sequence of twelve, any one of which can seen as representative, as all document the same action, but the point where both legs leave the air is the most quintessentially photographic. It is the image for which photography was made……..
To learn more about the men and women who posed for Muybridge’s motion studies, book now for Marta Braun’s lecture “Muybridge’s Models” – at the Tate Britain, Thursday 21st October, 1pm. Don’t take my word for it – see for yourself the wonderful exhibition at Kingston Museum – now running. I was pleased to be asked to give a talk on the opening night (yesterday), following a shadow-play workshop by Zannie Fraser, and a magic lantern show by Mervyn Heard. Large Muybridge in Kingston posters greeted us as we walked to the Museum from the Station; an impressive promotion. From the first glance, it’s obvious that this is a very special exhibition. The quality of the design, build, (by James Rowlands) and of course the academic work by Peta Cook and Alexandra Reynolds that very clearly underpins the display will, I feel, be evident to any visitor. Late night installation by James Rowlands and team. And the artefacts look wonderful – even to those of us familiar with them. At last, this world-class Muybridge collection can be seen for what it is, even though two important objects – the 17ft long panorama of San Francisco, and the original Zoopraxiscope – are at Tate Britain. (There’s a faithful replica Zoop in the Kingston show.) But this exhibition is about the images that Muybridge showed on the screen, explained and displayed in detail – complete with animations – for the first time. Congratulations to Kingston Museum on fully achieving the objective. 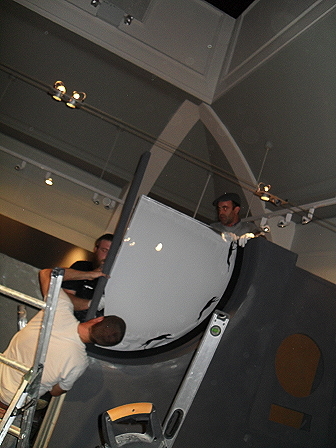 And I understand that an extra section, in the old Muybridge Gallery on the ground floor, will open around 1st October. No time to properly absorb everything last night, so a full review – with actual details rather than just superlatives – some time soon, after a second visit. Mo and I were invited to join a dozen or so for a meal afterwards, and we sat by the River in a restaurant/bar on the ground that was once the garden-yard of the Muggeridges, behind their home in the High Street, where one hundred and sixty years ago young Edward said goodbye to his family and set off on an adventure to the New World. 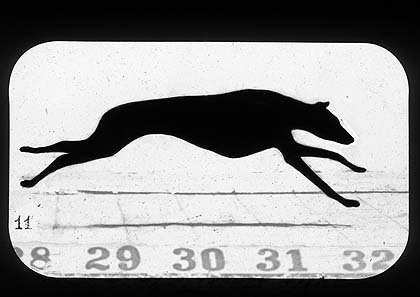 This exhibition places Muybridge’s unique discs within the context of both his career and the history of moving image projection. Displayed alongside the discs are some of the original photographic sequences that informed them, represented as collotype prints and images on glass. The relationship between the original photographic sequences and the discs form an integral part of a new interpretation of his work, the result of new research into the Kingston Muybridge collection. Other items on display include examples of Muybridge’s rare and intriguing ‘coded’ lecture slides, some of his equipment and a unique scrapbook charting his phenomenal career. Many of these objects have never been seen on public display before, providing an exciting opportunity to provide people with rare access to new knowledge through this important collection. To accompany the original objects, a beautiful replica of the Zoöpraxiscope forms a central part of the exhibition, alongside a specially commissioned set of animations which emulate the original experience afforded Muybridge’s audience through the Zoöpraxiscope. Also open now is the contemporary work ‘Dance of Ordinariness’ by Trevor Appleson, at the Stanley Picker Gallery. NK Gallery LLC (NKG) was established in 2010 by Natacha Sochat and Kathy Halamka. Our artists represent a broad and vibrant contemporary spectrum of ideas, approaches, and materials. “My current series of works are reinterpretations of Eadweard Muybridge’s stop-motion photos from the 1880’s. It is from toy flip-books of the photos comprising his seminal publication, Animal Locomotion, which my work borrows from. I am interested in the idea of playing with his iconic images– to make his frozen photos “move” again. 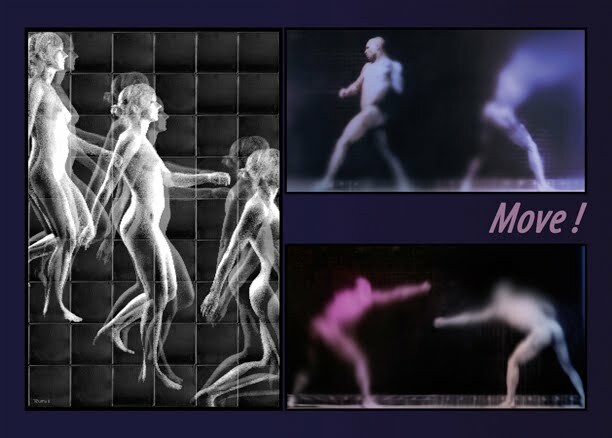 Muybridge’s high shutter speeds broke down movement into distinct visual images, separated by equal intervals of time that could be analyzed frame by frame, and to observe a cause and effect sequence for scientific study. From a physical point of view, each of the still images is actually a record of a period of time of about 1/2000 of a second, a short time but still a duration of time. From a phenomenological point of view though, can this freeze-frame image, in a sense, be re-activated to release the latent motion it originally recorded? With Photoshop, I alter Muybridge’s image by distorting, blurring, warping, stretching, or twisting to imply a sense of motion. I would like to elicit a metaphorical sense of allowing time to re-flow. Like pressing <PLAY> after the <PAUSE> button has been on for the past 125 years. But how is this new motion read in today’s time? What visual consequences present themselves by re-animating the flow of time? 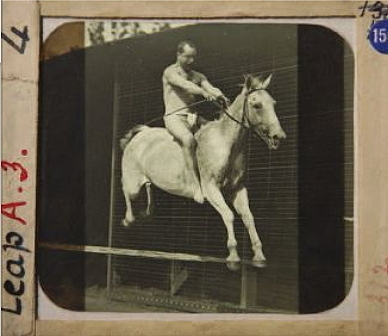 I feel a new narrative is posed by the isolation of a single Muybridge image from the context of its original sequence. My selection of alternate colors further jars the meaning. Effects of blurring and distortion torque the space. 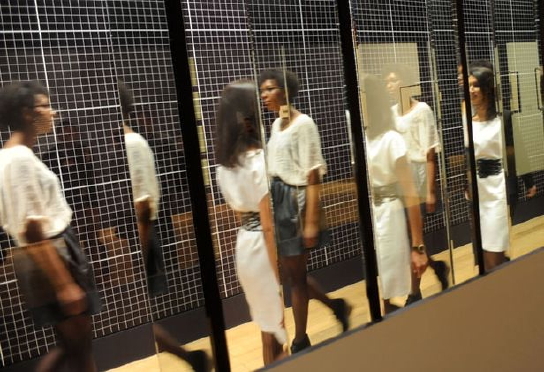 Multiple and mirror images lend tension or evoke other pattern-based associations. “Years ago, as a filmmaker, a fascination with antique motion picture toys led me to wonder if I could create movies on a grand scale using no electricity, moving parts or special lighting. After some experiment I developed an 8” square, three-pound, lens-ribbed glass tile, which I called a LIFETILE. By combining many LIFETILES, I found I was able to create large-scale “Movies for the Wall”: optical wall pieces that appear to come to life, move and change when the observer walks by. Since 1990 I have created large-scale LIFETILES murals for the Smithsonian Institute, AMTRAK, the BART subway system in San Francisco, science museums, aquariums, zoos and dozens of other public places around the world. While I continue to accept commissions, I now also create smaller, limited-edition LIFETILES compositions for galleries and private collectors. The success of LIFETILES inspired me to develop my own patented line of smaller-optically animated items: CineSpinner™ Suncatchers with images that spring to life in a window when they rotate at the end of their string and Smart Move™ greeting cards with pictures than move realistically when they are opened. I also continue to expand a line of bestselling childrens’ Scanimation® books for Workman Publishing. 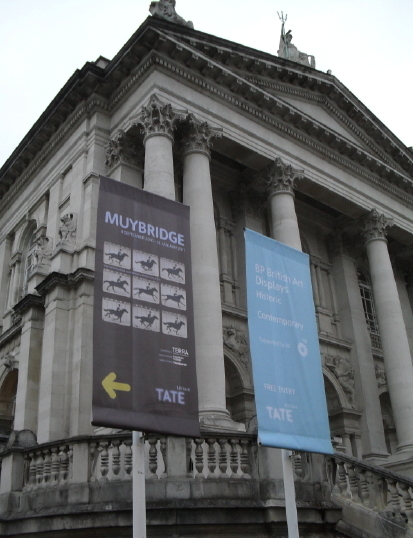 Here are some of the many, many reviews of the Tate Britain’s Eadweard Muybridge exhibition. More to follow, after all the fuss dies down and I can take a breath. “The man with the long beard looks more than a little odd, his deep-set, strangely catlike eyes seeming to look backwards into an intense inner world. Even by the standards of the 19th century, when great men from Tennyson to Carlyle cultivated the look of Old Testament prophets, Eadweard Muybridge, who adopted the eccentric spelling of his first name in imitation of a Saxon king, looks a few sandwiches short of a picnic…..
Muybridge died, back home in Kingston, essentially a disappointed man, in 1904. And as David Hockney, a lifelong admirer, points out, without the interest of artists, he’d probably have been forgotten. ‘The cinema made him irrelevant. But his books were such an incredible repository of images for artists to use. Every art school had a copy of The Human Figure in Motion,’ he says. Hockney transposed a frame of Muybridge’s Seated Woman Drinking Tea, Being Served by Standing Companion into a painting of his own of the same title. ‘The title gives it a quaintness. There is an eroticism in his work, but it’s offset by the sense of scientific inquiry,’ Hockney says. Now here’s a treat – a preview of the short video made by Chocolate Films, for the Muybridge Revolutions exhibition at Kingston Museum. Check out the video on their new website.